Kentucky Living Magazine photo shoot in August. with this table set for four. four different Christmas teacup trio sets. The next trio is a pretty vintage Royal Albert "Poinsettia"
The third place is set with "Christmas Rose" by Royal Albert. for the Kentucky Living Magazine photos. Pretty settings. Thanks for sharing with us. Gorgeous Linda! 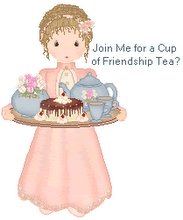 I shared the Rosina Noel today for Tuesday Cuppa Tea. Gorgeous patterns. Hard to choose! Your china is so beautiful, Linda! Beautiful! I love that you even have Christmas trios (of course you do! ), and they sure do blend beautifully, don't they? The settings are so pretty and festive. How fun to celebrate Christmas in your tea room since August.